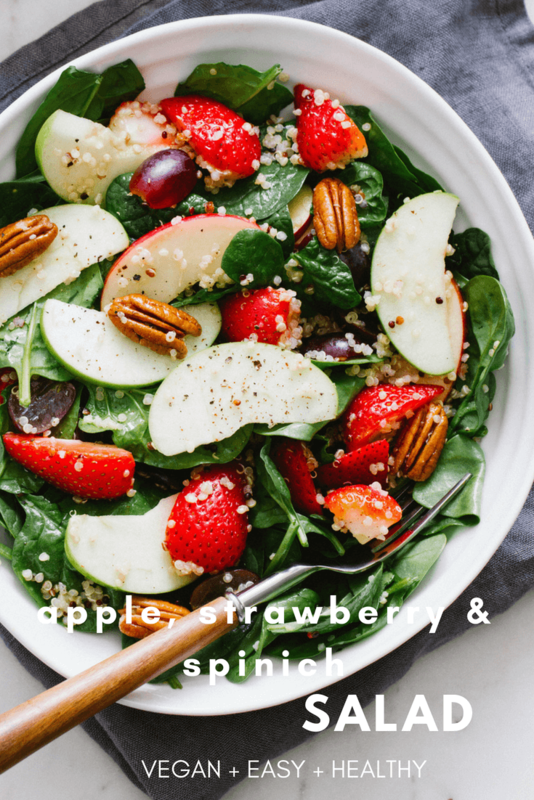 I hope you are ready for some freshness, because today I have for you a very easy and most delicious Strawberry, Apple + Quinoa Spinach Salad! 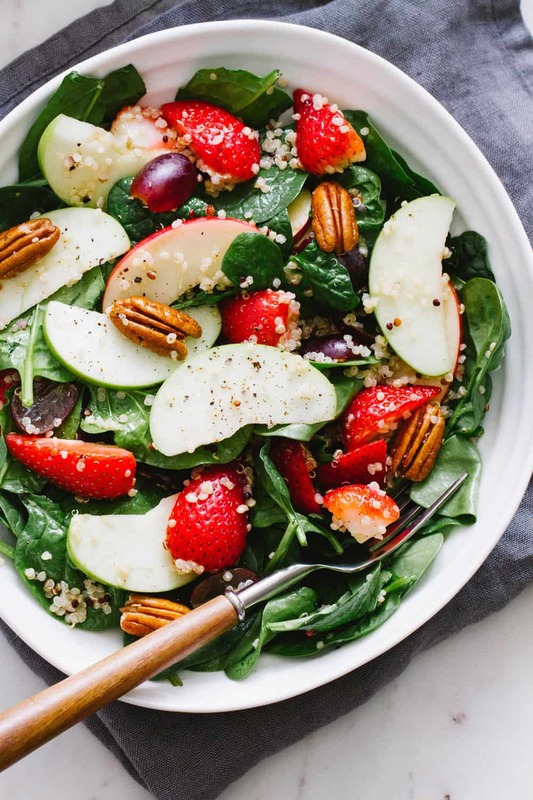 It’s a nutritious combination of brightly colored strawberries, crisp apple slices, juicy red grapes, all tossed with quinoa, pecans, spinach, and finished off with a simple balsamic dressing. 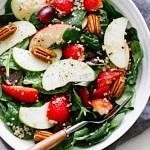 Light, yet filling, this is a perfect salad for a healthy lunch or a light dinner. On a recent trip to Target, I was inspired while wandering through the produce section. There was a photo of a similar salad, minus the quinoa, by the fresh greens in the refrigerated section. 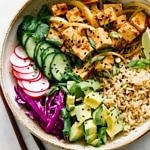 Lately, I’ve been craving lighter fare and it immediately grabbed my attention, inspiring me to recreate something along the same lines. And so you have it, a delicious interpretation! It may not be a wildly new salad, but it is a classic and much deserving to be in the recipe collection. Feel free to change up the amounts of fruit you use, using more or less of any ingredient that suits your taste. For the quinoa, I found the 1 cup to be a perfect amount adding some carbohydrates, protein and extra fiber. The pecans pair well with all the ingredients, but you can change it up using walnut pieces, slivered almonds or pepitas if you prefer. 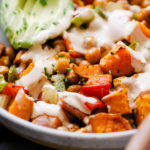 The dressing is very simple, letting all the flavors of the salad ingredients to shine through. For the dressing, use either a dark or white balsamic vinegar. I used a white balsamic here as that is what I had on hand. Either one works perfectly here. I like my dressing a little on the peppery side, but of course you can add fresh cracked pepper to suit your taste. 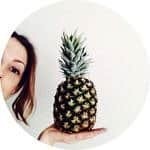 So gather your ingredients, and in no time you will be ready to enjoy a little healthy, fruity freshness! Start by preparing your strawberries and grapes. Next, make the simple balsamic dressing by combining the olive oil, balsamic vinegar, dijon, pure maple syrup, salt & pepper. Lastly, add it all together in mixing bowl and combine. 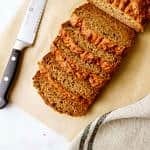 So simple, delicious and lip smacking good! See all vegan Salad recipes on TSV! This light and healthy salad is dressed with a simple balsamic dressing. 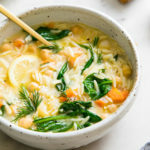 It makes for a refreshing lunch or light dinner. Dressing: In a small bowl whisk together the oil, vinegar, mustard, maple syrup, salt, and pepper until well combined. 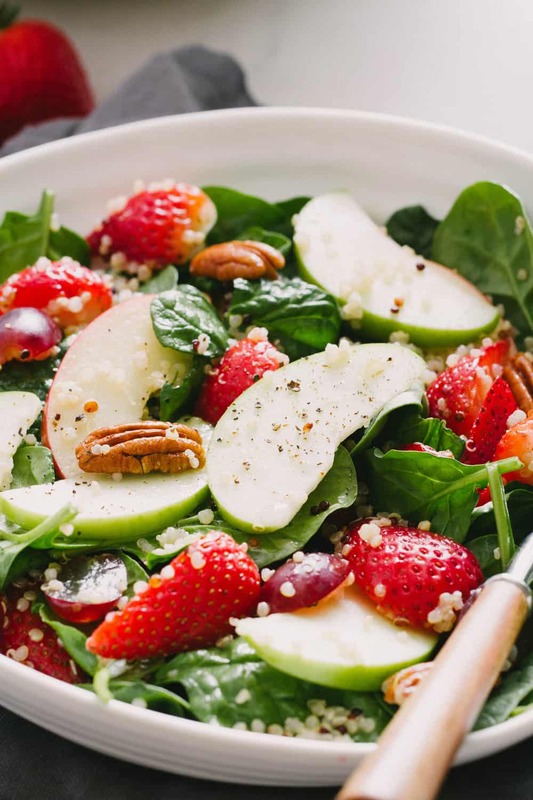 Salad: In a large bowl add the greens, quinoa, strawberries, apples, grapes and nuts. Pour dressing over salad mixture and toss to combine. The pecans were delicious here, but feel free to use walnuts halves, slivered almonds, pepitas or hemp hearts if you prefer.